Looking for a unique statement piece? This beautiful necklace totally fits the bill with its unique color combination and sparkling pewter accents. Love Eastern Inspired jewelry? 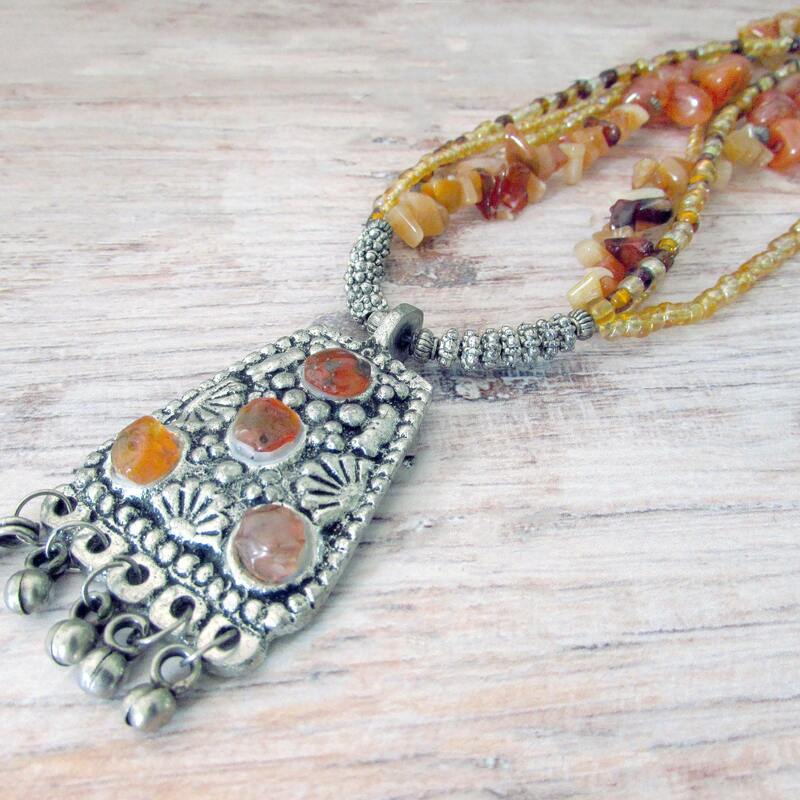 This gorgeous long layered bohemian necklace features thick, silver-plated, Bali style beads with amber glass beads, Carnelian chips and smooth tumbled Carnelian as well as Brown Onyx nuggets. The pendant of was made from silver-plated cast pewter and set with lovely chunks of Carnelian and jingly bells. This gorgeous necklace is sure to become one of your favorite pieces. Carnelian is believed to be a clarifier for the voice, to aid in fertility, to stimulate sexuality, dispel apathy, and stimulate creativity as well as the appetite. Onyx is believed to help in the release of negative emotions, promote vigor, and impart self-confidence. It is also believed to treat disorders of the bones. The matching earrings reflect the same gemstone chips, silver beads, and glass beads as the necklace. The ear wires are nickel and lead-free silver plated pewter.